During the butterfly surveys in the mid-90's the Plain Tiger was rarely seen in Singapore. Although observed once in a while, it was by no means common at all, and infrequently seen in parks and gardens. Today, with the cultivation of its caterpillar host plants, Asclepias currasivica and Calotropis gigantea at public parks, schools' eco-gardens, park connectors and so on, the Plain Tiger is a commonly seen butterfly. 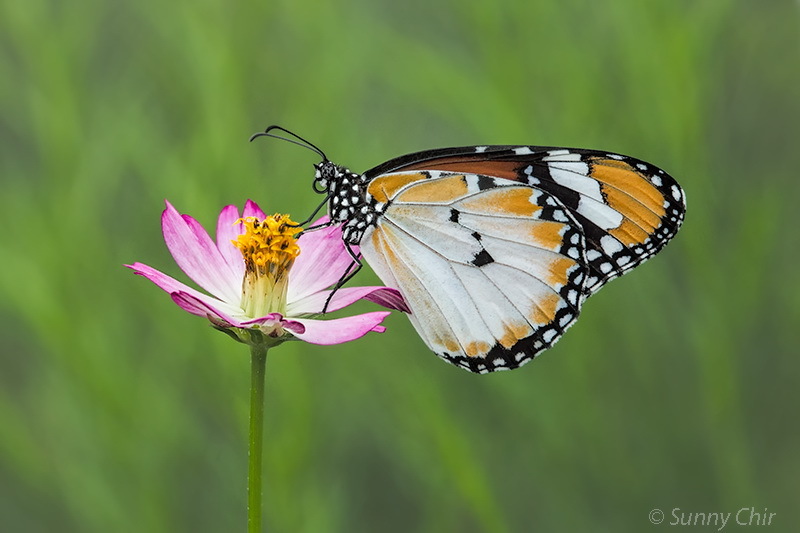 This female Plain Tiger feeding on the flower of the Cosmos sp. was shot by ButterflyCircle member Sunny Chir at Gardens by the Bay a few days ago. The species can be seen fluttering around the flowering plants at Gardens by the Bay, and in particular towards the Meadow area of Bay South Garden where its caterpillar host plant is grown.